The International Committee of the Red Cross (ICRC) provided medical supplies to Mendi Provincial hospital; these can provide treatment for up to 2,000 minor wounds, after the 7.5 magnitude earthquake that struck the Highlands of Papua New Guinea on February 26th 2018. Dr. Martin Sa’avu Director of Medical Services for Southern Highlands Provincial Health Authority said at Mendi Hospital that seven people brought to the hospital have been confirmed dead. The number could rise as access to remote areas is foreseen in the coming days. “These materials are vital and timely to help us care for the victims of this tragedy, we pray that our people will endure this sad experience,” Dr. Sa’avu said. 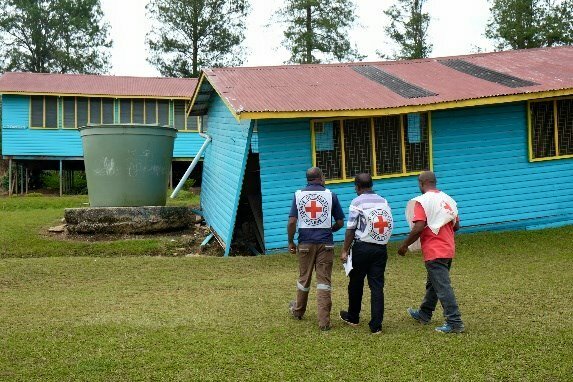 The ICRC is working closely with the PNG Red Cross and the International Federation of the Red Cross and Red Crescent to identify the pressing needs and mobilize resources. It is also coordinating with the PNG government and other stakeholders. “It is still difficult to estimate the full scope of this tragedy due to the remoteness of these areas. Many roads having been affected and it make access even more complicated.” said ICRC Head of Mission, Mark Kessler. “We are saddened by reported loss of lives and very concerned about the situation for the Highland populations,” he added. The ICRC has also said that based on our initial assessments, the hospitals in Mendi, Kagua and Ialibu are functional. Mendi hospital has suffered minor damages to its infrastructure and medical equipment has been destroyed. “We will continue our efforts to reach areas mostly affected by the disaster. Next, our teams, together with PNG Red Cross volunteers will be heading to Hela Province and Nipa District in order to have a first-hand picture of the situation as we continue to coordinate with the government and other stakeholders to provide further assistance,” Kessler concluded.